Carry this leather bag anywhere and anytime as it never goes out trend. "Handcraft" brings the most stylish ad innovative bags just for you. 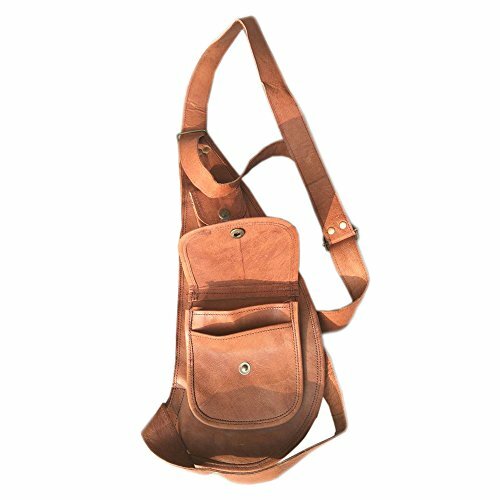 Generous and modern look this bag pack will catch all the attention and will lend a perfect finishing touch to your semi-formal or casual look.Environment Friendly & Handcrafted : - This leather product is made without using any kind of chemicals and hence is totally skin and environment friendly. Also no harmful substances were used while processing the leather. Polishing helps to increase the age of leather products and hence this bag has vegetable oil polishing which is totally natural gives the bag a perfect vintage look by also keeping it user-friendly--- ####--- 100% Genuine Leather :- Leather we all know is known to be aesthetically pleasing, and it's a status symbol and genuine leather is known to have more qualities than being the status symbol. This bag has the class and quality of pure leather due to being made from the same. It's not only bio-degradable but also eco-friendly and stylish. Being made from original leather this bag has great durability and flexibility and it ages well. It's is said for leather 'the old the better'....PLEASE NOTE : - This product is made by Pure leather, by nature, has some scars (due to markings/cuts on goat skin) which reconfirms that the leather is 100% genuine. Due to this unique characteristic, each of our leather products is one of a kind, which adds character to your prized possession. Each leather product has a distinctive color tone, which may be different from shown images. The new leather product may have a distinctive leather smell. It will fade away within 3-4 weeks of regular use. Note-- We are connected with a number of Organizations within India specially Rajputana's Desert which work to bring employment to artisans and keep alive traditional skills. Compartments 1, Outer Pockets : 3, Lock Type : Zip Closure, Adjustable Shoulder Strap : Yes, Outer Material : Leather, Inner Material : Canvas. NOTE: Each bag has distinctive color tone, which may deviate a little from given pictures. Because every bag is handmade from leather which is naturally tanned and not chemically treated, each bag has unique and individual markings and coloring's and may vary slightly from our photographs. If you have any questions about this product by Handcraft, contact us by completing and submitting the form below. If you are looking for a specif part number, please include it with your message.